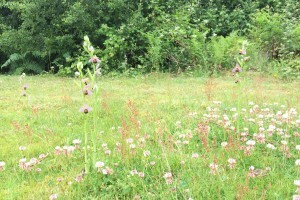 The Bee Orchids are now in flower at Langmere Lakes. 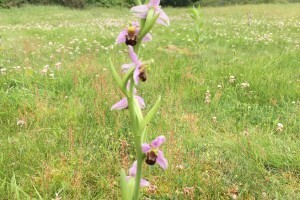 The Bee Orchid gets its name from its main pollinator - the bee - which is thought to have driven the evolution of the flowers. To attract the pollinating bees, the plant has evolved bee-like flowers; drawing them in with the promise of love, the bees are naturally attracted to the flowers and fly in to attempt a mating. As they land on the velvet-textured lip of the flower, the pollen is transferred and the poor bee is left frustrated. 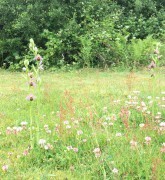 Sadly, the right species of bee doesn't occur in the UK, so Bee Orchids are self-pollinated here. Look out for their diminutive flower spikes around Langmere from June to July. 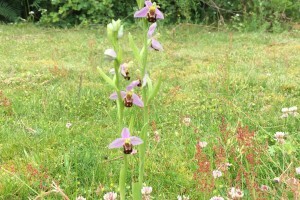 A small orchid, the Bee Orchid has a rosette of leaves at ground level and two leaves that grow up the stem as a sheath. The stem displays a number of relatively large flowers with pink sepals that look like wings and furry, brown lips that have yellow markings just like a bee.